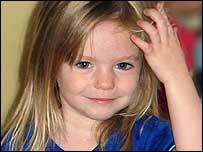 Police hunting missing Madeleine McCann have failed to find any new evidence after a search at the home of the only official suspect, the BBC understands. Detectives in Portugal conducted a new two-day search at a villa about 100 yards from where Madeleine vanished. Briton Robert Murat, 33, who denies any involvement with the disappearance, was present during most of the search. Madeleine, four, from Rothley, Leics, went missing from an Algarve holiday apartment in Praia da Luz on 3 May. Publicly the police have not commented on the results of the weekend search but the BBC understands it revealed nothing to link Mr Murat to Madeleine. Over the weekend British and Portuguese detectives scoured the property using hi-tech scanning equipment and a British sniffer dog. Officially Mr Murat remains a suspect and this week detectives will re-examine a car and a van used by him and his elderly mother. Mr Murat believes that in time he will be cleared of any wrongdoing. Mr Murat's spokesman, Tuck Price, said the suspect was doing his best to help the police with their inquiries. Mr Murat, who was declared a suspect 10 days after Madeleine was last seen, was not arrested or questioned. The BBC understands British police were invited to review key aspects of the case by their Portuguese counterparts. Police are also investigating a possible sighting of Madeleine at a restaurant in Tongeren, Belgium, on the Dutch border. On Sunday, Madeleine's parents Kate and Gerry McCann attended Mass at a local Catholic church in Praia da Luz. Mrs McCann has also spoken of her regret at leaving her children alone in their holiday apartment while she and her husband Gerry had dinner at a nearby restaurant on the night Madeleine disappeared. "We are just so desperately sorry. Every hour now, I still question, 'Why did I think that was safe?'." The McCanns have backed a scheme aimed at letting parents and staff know what steps to take as soon as a child goes missing on holiday. Code Madeleine is based on Code Adam in the US, named after abducted six-year-old Adam Walsh.